If It's Too Loud...: Field Mouse - "The Mirror"
A few months ago I rediscovered Field Mouse's Hold Still Life, my favorite album of 2014. 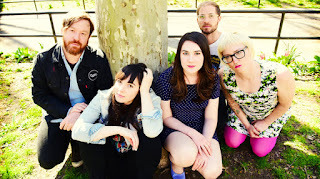 The band is one we clearly love here, and their new album is coming out in August on Topshelf. They've been slowly tweeting out information on the album recently, but NPR debuted their new single "The Mirror" today, and we get our first glimpse as to what to expect. A slow, Field Mouse-ian intro blasts wide open with a wall of fuzzed-out guitars and the song just doesn't let up after that. Combine that with what is the catchiest chorus the band has put out yet, and not only is this song a true winner anyway, but feels both fun and defiant at the same time right through its appropriately abrupt finish. I hope this ends up being the sort of breakthrough this band deserves, because this song is just crazy great. I don't feature individual songs here very often, so for me to be so excited by a song to share it immediately should tell you something.